How can Skoog support children with Autism? Listening to music can make us cry, it can bring back happy memories, it can make us feel excited, or help us to relax and sleep late at night. Its sounds and sensations make us experience emotions and feelings that words cannot create. For many, it can be life-changing! Creating music is a powerful form of self- expression; a way of translating these feelings into sound, and sharing them with others. For many children with Autism, expressing emotions or ideas can be particularly challenging, which playing music can be used to overcome. Adapted musical instruments, which are accessible for children who cannot play, or have not yet learned to play conventional instruments such as the piano or guitar, enable anyone to create music, and reap the benefits of this expressive process. This means that everyone can enjoy music regardless of age, physical or musical ability. 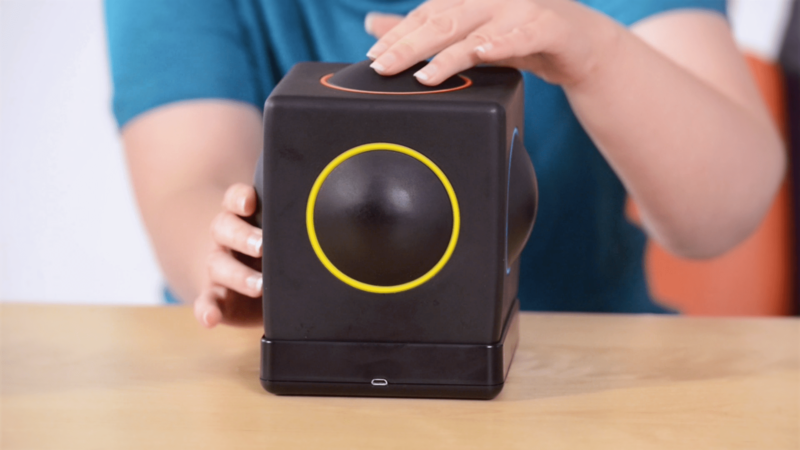 The Skoog has been used by music therapists who work with children with autism. The Skoog is an innovative musical instrument that can be used by everyone. It works because it is truly accessible and one of a kind. The Skoog is easy for anyone to pick up. It is tactile and easy to hold, with no awkward hand positions, and a comfortable soft cube shape that you can’t resist squeezing. It is interactive and offers the opportunity to be as creative as you like. You can link Skoog up to Spotify to play your favorite song, or select a range of instruments in GarageBand. Sandy Matheson is a music therapist from Scotland, who has been working with a student, Tom, who has an unconfirmed diagnosis of ASD/LD. He introduced Tom to the Skoog 2.0. ‘Tom is a gentle, dreamy five-year-old boy, who is not verbal, but occasionally vocalizes. His mum noticed that he respond positively to musical stimuli of various kinds, and that’s how he began music therapy! After four assessment sessions, it was immediately clear that Tom is a highly tactile child; he explores and investigates his environment by touching and holding objects (and sometimes popping them in his mouth). For this reason, I decided that Skoog might be an appropriate instrument to draw him into a musical relationship. Tom was intrigued by this strange, colorful object, and delighted by the sounds it made. His first response was to try to eat it, but it didn’t take him long to understand the relationship between touching various parts of it and the different sounds that could be achieved. The Skoog brings children a range of benefits that can be gained by learning a musical instrument. Crucially, the difference is that it is accessible for all children. Holding a guitar, remembering how the keys on a piano work, or learning how to breathe into a wind or brass instrument, can be especially challenging for children with Autism, or no previous experience of playing music. The Skoog is accessible and can be picked up by anyone, no matter what their musical ability. It can be adapted to be mounted so that those with limited mobility can play it. Where musical instruments may be seen as too difficult to learn, the Skoog can be picked up and used to play songs within the first hour of use, with room for progression as skills develop. The Skoog provides instant feedback as buttons are pressed to make a sound, building a child’s hand-eye coordination, and linking this to sound. The process of trial and error required to get a song or sequence of notes correct develops resilience, and the satisfaction of achievement when songs are successfully played. Hearing the notes played from their own actions, where making conversation may be difficult, is a powerful means of creative self-expression for many children. It is also a way for adults- both therapists and parents and guardians to share fun experiences with a child, and build emotional rapport in a new and innovative way. This brings immense joy to children hearing themselves create, and make melodies. Pattern recognition and following sequences are skills developed as children play along to songs using the Songbook feature. Children with Autism also enjoy singing alongside their Skoog, conveying their emotions through music. Skoog is available to purchase here. To get your very own Skoog 2.0, online or instore at Apple.